These heaters are available in 2” NPT and 2-1/2” NPT construction. The fittings and element sheath(s) are 304 stainless steel and suitable for corrosive environments. A limited offering of 1-1/4” NPT heaters is available subject to restrictions on element count, well size and thermostat range. The end user is responsible for installation. The installation must include a high temperature limit and, if a tank application, a low liquid level control. 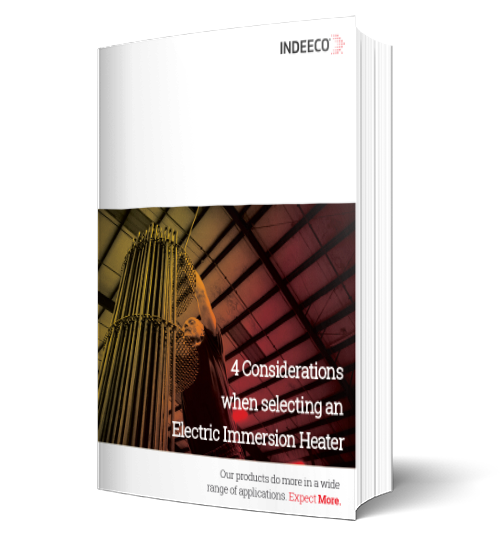 The Indeeco thermostat, if specified, is for process control of the application. For details on particular hazardous environments having potential for explosion, refer to Articles 500–516 of the National Electrical Code and/or Section 18 of the Canadian Electrical Code, Part 1. These heaters are designed to be permanently mounted in a horizontal position above the anticipated sludge level; they are approved for operation in a maximum ambient temperature of 40° C, 104° F.
Construction features include .475” diameter compacted tubular element(s), repressed U-bends, nested third element with spacer for structural strength and either 0–100° F, 40–120° F or 60–250° F process thermostat.